The brooch's first owner was the Queen Mother. In the spring of 1939, just before the outbreak of World War II, King George VI and Queen Elizabeth made a state visit to Canada. He gave her the brooch, which was made by Asprey, to mark this state visit. The brooch is made of diamonds set in platinum; Hugh Roberts describes it as being "in the form of a leaf of the Canadian Sugar Maple ... the national emblem of Canada, transparent-set with brilliants and baguettes." Elizabeth wore it in public for the first time as they crossed the Atlantic in May 1939 on their way to Canada. It quickly became a staple in her brooch wardrobe. 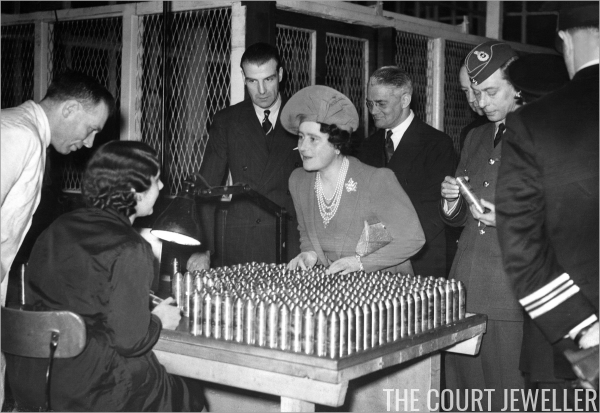 In the photo above, she wears the brooch during a tour of an ammunition factory in April 1940. The Queen Mum wore the brooch for the rest of her very long life -- literally. Above, she wears the brooch in October 2000, a few months after her 100th birthday, to receive the insignia of the Order of Canada. 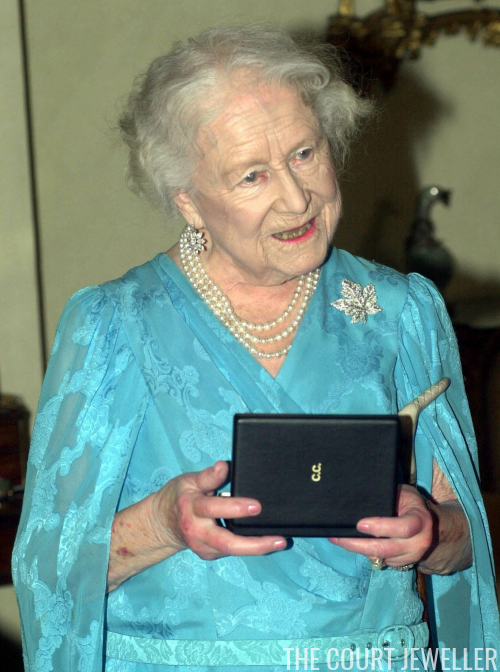 The Queen inherited the brooch from her mother in March 2002. 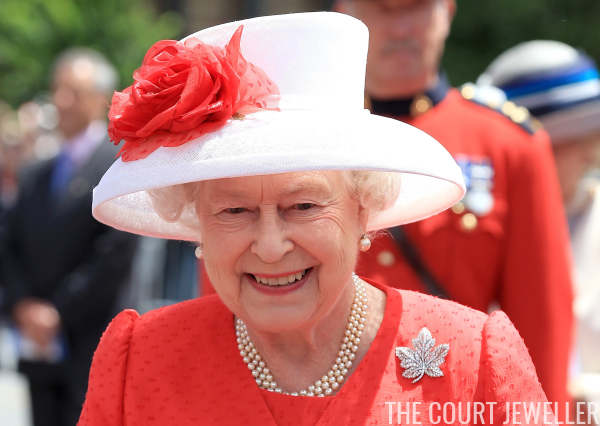 Today, she frequently wears the brooch both on trips to Canada and for events in Britain related to Canada. In the photo above, she wears the brooch at Canada House in London to pay tribute to Canadian service members who died in the First World War. The event was held in November 2008 (hence the poppy accompanying the brooch). Although the Queen only inherited the brooch fourteen years ago, she had worn it decades before. She borrowed the jewel from her mother for her first trip to Canada in 1951, when she was still Princess Elizabeth. 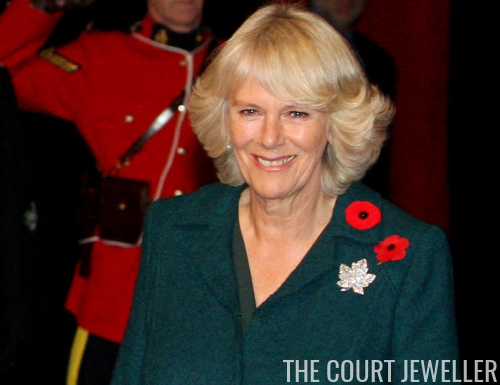 After inheriting the brooch, the Queen followed in her mother's footsteps by loaning it to her daughter-in-law, the Duchess of Cornwall, for her first official Canadian visit. 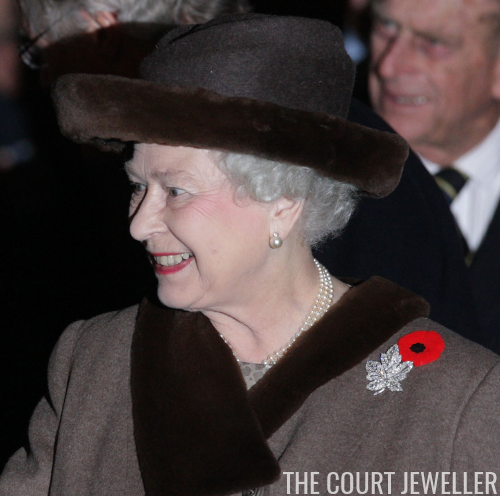 Camilla wears the brooch above in November 2009 for a welcome ceremony in St. John's. And Camilla isn't the only family member who has borrowed the brooch in recent years: the Queen also loaned the brooch to her granddaughter-in-law, the Duchess of Cambridge, for her first tour of Canada in 2011. 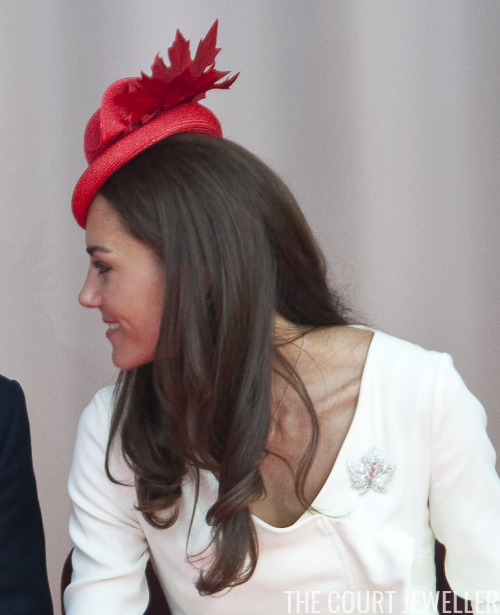 Kate wore the brooch on Canada Day in Ottawa, pairing it with a fascinator that was appropriately festooned with red maple leaves.